Local venison is not something typically available at area restaurants, however on January 12-14th it will be featured at Market Pizza in the Stockton Market. The special food event is a part of a fundraising effort on behalf of Hunters Helping the Hungry in Hunterdon County. Rotarians Megan Jones-Holt, Clinton Sunrise Rotary, and Lester Giese, North Hunterdon Rotary, have teamed up once again to raise money for Hunters Helping the Hungry(HHH) and continue to bring awareness to Rotary’s Hunger in Hunterdon Campaign. Through the Market Pizza and Hunters Helping the Hungry Partnership, Jones-Holt has raised enough to provide over eight thousand meals for the organization. Megan, Partner and Chef of Market Pizza, uses her passion of creating unique food experiences to host the event. All artisan gourmet pizzas are personal sized with creative weekly specials such as Shrimp and Grits, Brussel Sprouts with Pistachios, and Cranberry Bacon. 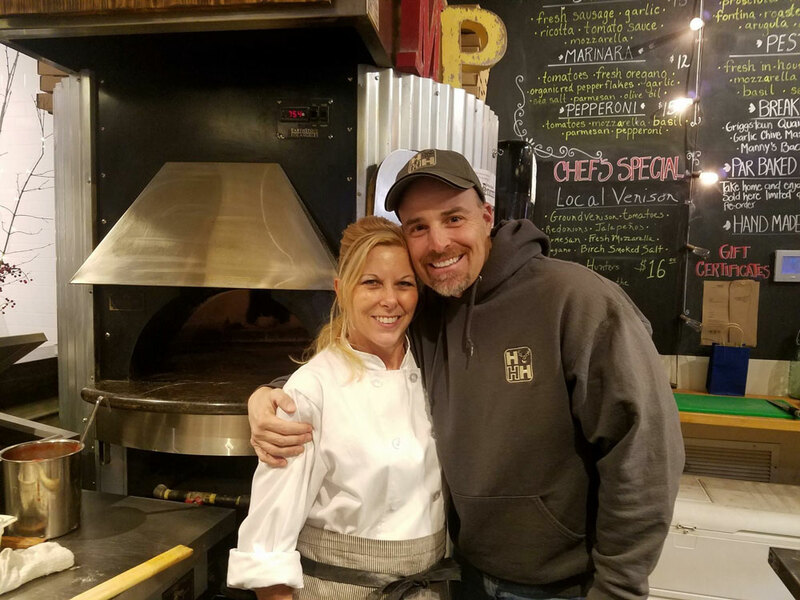 Market Pizza was named 2017 Hunterdon Happenings’ Best Pizza and Jones-Holt was just nominated by Edible Jersey (www.ediblejersey.ediblecommunities.com) Local Heroes for Food Artisan. Les, is an originating member of the 501c3 non profit organization formed in 1997. Area hunters donate their deer to select NJ State Health Department inspected HHH partner butchers. The meat is then distributed through NORWESCAP. All money raised goes towards the processing of the venison, with over 1.6 Million meals donated to date. The venison that will be used has been donated by Mark Charbonneau, board member and processed by Game Butchers on Route 31 in Lebanon. The meat and event has been approved by the New Jersey Division of Fish and Wildlife, the State of NJ Health Department and the Hunterdon County Health Department. This fundraiser has a wide appeal to adventurous foodies and avid hunters. It will be the kick off to four weeks of Wild Game featured pizzas. For each venison pizza purchased, proceeds will go to the Hunters Helping the Hungry organization. For those less adventurous and still want to participate you may select from the regular menu or visit any one of the other food purveyors located in the market and make a donation directly to the organization. HHH members will be at the market to accept donations and answer any questions about the organization. The kick off Friday night will also feature the music of the TieDye Hillbilly Dance Band from 6-8PM. Hunters Helping the Hungry donations may be mailed to P.O. Box 587, Lebanon, New Jersey 08833 or through Paypal on our website: www.huntershelpingthehungry.org.